Move over Ramen burgers and Korean clam chowder, the infatuation of making two very different concepts work together in flavors and offerings is not limited to food in the restaurant industry. Commercial furniture is reflecting the mashup trend by taking differing materials and combining them to create unique pieces to accent your restaurant. You wouldn’t bat an eye at a wood table top and metal base, but what may catch your attention is these two materials together in a chair or bar stool. This trend has gone by many names: rustic industrial, modern rustic, vintage industrial. The list goes on and has been present in the home décor and architectural industries for some time. These materials together highlight their contrasting points while also making a great pair. When wood is used in design, it carries a warmth and neutrality with it. It feels earthy and organic. In contrast, metal can bring a manufacturing-like or contemporary vibe. With its hard an unbending feel, it’s completely the opposite of wood that is soft and easily affected by its environment. The wood and metal hybrids are a marrying of the two that create something totally new yet familiar. Visually these compositions meld together but they also work well structurally. In a restaurant, metal is less easily scratched and cracked, making it ideal in combating daily wear and tear over wood. 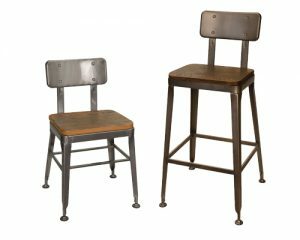 When metal is used to reinforce a wood seat or back in a frame, the chair or bar stool becomes more durable. With the popularity of the wood and metal hybrids, we have quite a few designs that are right on trend for your restaurant. Solid oak wood and black powder coated metal come together in the Erwin Collection. The rustic look of this collection is defined further with a traditional X-style back and stylized legs. The Elliot Collection updates the classic ladder back design by using solid oak wood and a weathered iron for an industrial look that’s softened by the wood back and seat. The Henry Collection keeps it simple with squared off wooden backs and seats, giving this collection an understated modern look. 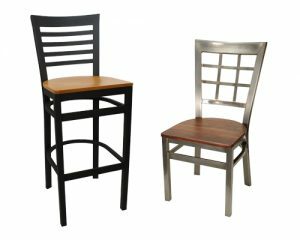 The distressed wood paired with the slim yet sturdy, black powder coated frame makes it an easy pairing with other restaurant furniture. The metal frame of the Piper Collection brings a breath of fresh air to restaurants with its hairpin leg design. Embracing the rustic industrial look, the sleek steel contrasts the deep tones of the oak to warm up any dining area. From window pane to full ladder back to vertical back, we have all your classic styles covered with the Gladiator Collection. Traditional back designs make this collection extremely versatile and are right on trend with their steel frames and variety of wood seat options. Think grit, think modern, think mechanical. All of these can describe the strong metal look of the Simon Collection. 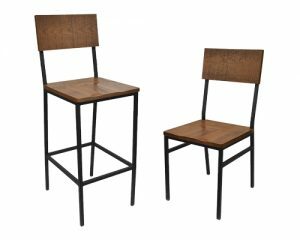 Because this collection comes with a variety of wood seat options to offset the smooth steel, Simon’s are a standout statement piece in a rustic restaurant atmosphere. Each of these collections use a metal frame with a wood seat and/or back. Together, these materials create a unified theme for your restaurant by pulling from warm and cool tones. Restaurants need furniture that can meet the hectic demands of the industry with durability and visual appeal. And just like a leader of the mashup movement, the cronut, these wood and metal hybrids give you the best of both worlds. 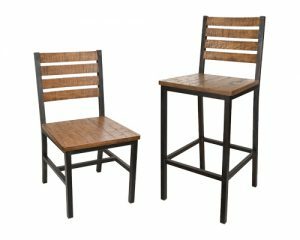 Do you use wood and metal hybrid furniture in your restaurant? What are your thoughts on this hybrid furniture trend? Tell us in the comments below. 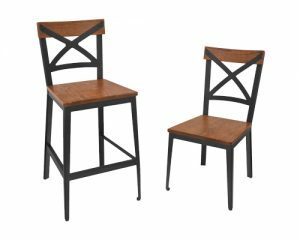 When Is a Good Time to Order Furniture For Your Restaurant? Something even the most knowledgeable restaurant owners seem to be unsure of is when they should order furniture for their new restaurant. In the world of express shipping and Amazon Prime, consumers tend to think that they don’t need to order things very far in advance. This is not the case with commercial furniture. When asking yourself “when should I order my furniture?” The answer is: the sooner the better. Ideally, you should begin your search at around 10 weeks before you want the furniture to arrive. It seems like a lot of time, but it will go by faster than you think. Starting earlier gives you time to research, place the order, and receive the furniture before your opening. The time it takes for your furniture to arrive on your doorstep is dependent upon a couple different factors. This first of which is the type of furniture you order. Items that are custom built such as reclaimed booths, or custom vinyl seats, have a production time, where other items might not. By calling in advance, you can also check the stock of the item you have your eye on. Popular items sell out quickly. Stock fluctuates daily and can affect your expected arrival date. Even if an item says out of stock it is good to call and see when the next shipment is arriving. The earlier you call the better to either reserve your items, or get your name on the preorder list. Transit time is another factor in your furniture’s arrival. Most large furniture items ship LTL. You’ll want to take into account the location of the place you are ordering from in relation to where you are located. Items traveling from across the United States are going to take longer than items coming from across the state. Purchasing outdoor furniture can be a little different than purchasing indoor items. If you are looking to get outdoor furniture for the spring/summer season, February is a good time to order. You want to have your furniture before the weather breaks and customers start asking to sit on your patio. Waiting too long to call could put you in the danger zone of not being able to receive your furniture until part way through the season. It is best to order your restaurant furniture well before your open date, about 10 weeks, to make sure that you can get the items you want, in the time frame that works for you. If you have your eye on some pieces that we offer at East Coast Chair & Barstool, you can get your order started today by calling our Customer Care Team at 800-986-5352. Posted on Jan 11, 2018 in Frequently Asked Questions • Comments Off on When Is a Good Time to Order Furniture For Your Restaurant? When the ball drops in Times Square on New Year’s Eve, it symbolizes a new year and a new beginning. 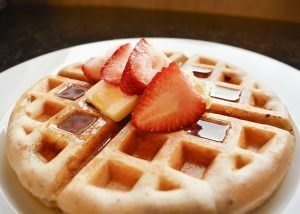 But this doesn’t always apply to the restaurant industry; fads turn to trends and stick around from one year to another. 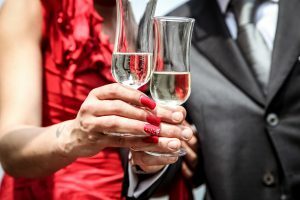 We’ve rounded up the popular restaurant trends from 2017 that are going to be around for the ball drop and the first part of 2018. Less is more cocktails. 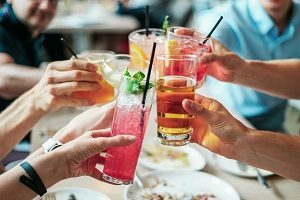 Many restaurants are beefing up their drink list with lower proof drinks by getting more playful with ingredients and lessening the alcohol content. Not only do bartenders get to have more fun with the flavor palate of the drinks, the profit margin widens as well by using less alcohol. 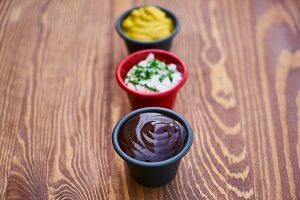 House-made condiments. Restaurants are striving for originality, down to their sauces. Think house ranch, mayonnaise, and sriracha-infused ketchup. Chefs are getting creative and complementing dishes with flavors that round out the tastes. Cold brew coffee. Lose that koozie! Cold brew coffee is past the fad phase and rocketing into 2018 as a staple in many coffee shops and restaurants. 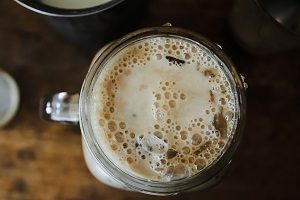 This new way to brew coffee offers many facets of customization that lets the restaurant owner (and customer) get a little creative when it comes to more caffeine in the same cup. 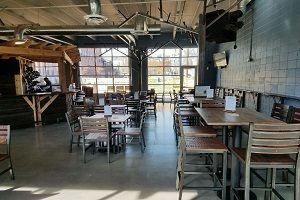 Local beer partnerships. You can grab your favorite local brew just about anywhere. 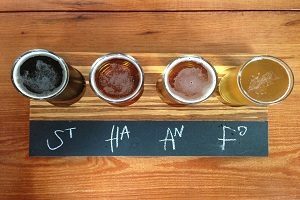 Many restaurants are partnering with local breweries and wineries to put their fares on tap right next to the big distributors. This not only promotes businesses in the area, but also increases a sense of involvement in the community. New ways to order. There are very few things in this world you can’t use your Amazon Prime account for anymore, including food delivery. And it’s not just Amazon. Food delivery services range from Amazon to the restaurants themselves to GrubHub and Postmates. These services get food to the consumer, without them every stepping foot in your restaurant. Conscientious cooking. The world’s eyes are wide awake to the food waste problem and is reflected in the restaurant industry’s attitude towards less-waste cooking. 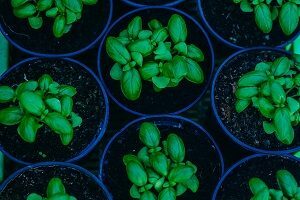 A restaurant adhering to more sustainable practices is becoming much more common. Inclusive menus. Vegan, vegetarian, and gluten-free options are showing up on more and more menus. 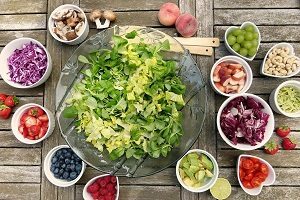 Being more inclusive with dietary restrictions has been on the rise in 2017 and will continue into 2018. 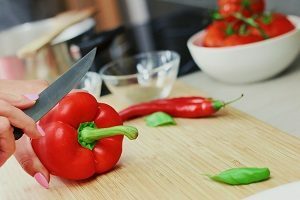 Adding these options to your menu can be the deciding factor for customers with food allergies and auto-immune disorders like Celiac. Digitizing payment. Customers can now eat, drink, and pay all from the comfort of your restaurant booth. 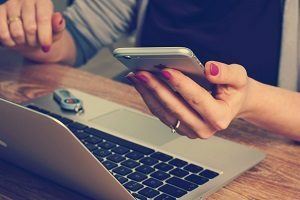 From kiosks to digital receipts to mobile payment, many restaurants are moving towards using paperless payment for a streamlined procedure for customers. As this technology becomes more affordable, the practice will continue to spread in 2018. Food halls. After exploding onto the scene, food halls are becoming more and more the norm. 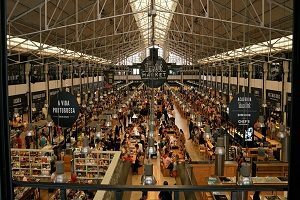 Per Cushman & Wakefield, “the number of food halls operating in the United States is expected to exceed 200 in 2019”. This number has grown every year with many slated to open in 2018 in urban markets like Atlanta, Manhattan, and Austin. Wood and metal hybrid furniture. Here’s a juxtaposition we can get behind! 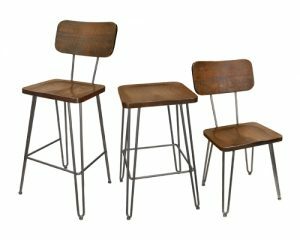 Combining the warm tones of wood and the industrial cool of metal create quite a contrast in furniture, this trend is all over chairs, bar stools, POS stations, and tables. With hybrid furniture, it becomes so much easier to pair pieces together when there’s a little bit of both wood and metal in them. Who doesn’t want the best of both worlds in their furniture? Introducing color. 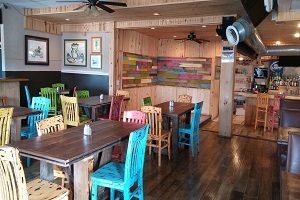 Whether it’s the furniture, centerpieces, or a mural wall, restaurants are gravitating toward bright colors rather than darker browns and blacks. This kind of design gives restaurants more of a fun and fresh feel, often set on a white backdrop. Tile is here. 2017 brought the tile out of the bathroom and put it behind the bar. 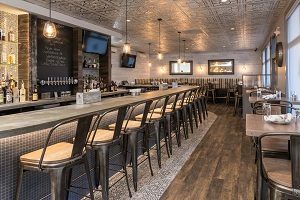 Restaurant designers are using tile on backsplashes, bar fronts, and accent walls to add texture and focus. Move over wallpaper, this is the year of tile! Which of these trends do you see sticking around longer into 2018? Tell us in the comments below!